​When I drink a great Rhône, it is as if my heart and palate have traded places. ​Wine expert Robert M. Parker, Jr.
After the great fun evenings of winemaker dinners this week, we have scheduled another one next week! On Monday May 22 we’ve added another dinner with a great winemaker from Gigondas in the Rhône Valley. We’ll have the honor of having Florence Cartier, owner of Domaine Les Gouberts talk about 5 of her top-rated wines as we enjoy a wonderful Mediterranean dinner with each course paired with one or two of her wines. ​This event is part of the Rhone Valley Vineyards Bistro project that is headquartered at Pierre Loti Chelsea until May 24th. 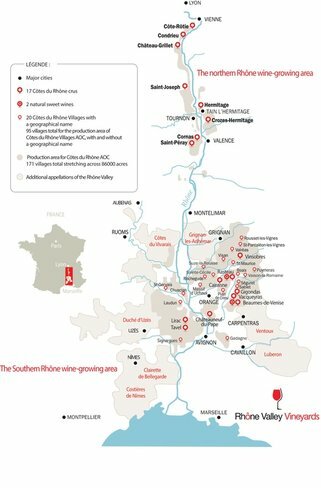 There will be special Rhône happy hours every day, wine dinners and a sweepstakes to win a trip for two to the Rhône Valley.